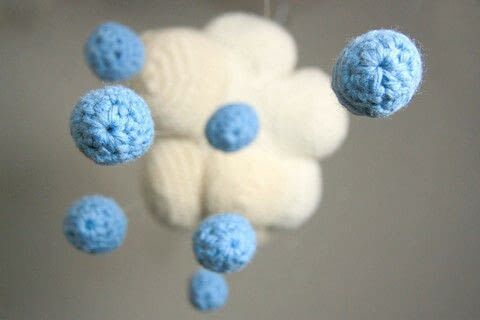 A cloud mobile for a window, above a crib, or any workspace that needs some whimsy! Today is the second day of the year that I've seen a warm sun. 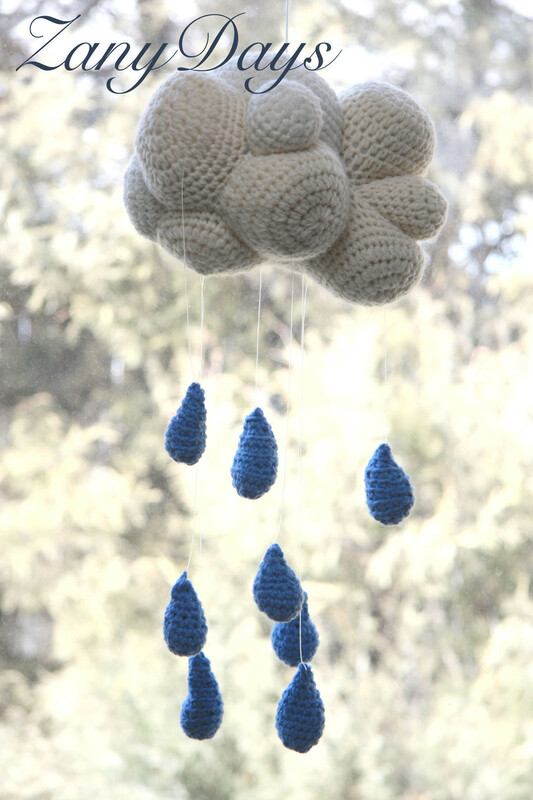 So, of course, I wanted to make something that represents something gloomy and wet, like rain =) I've always wanted to make a mobile, and today I finally found the motivation. I've seen some of these for sale with no patterns listed for free, which I thought was just ridiculous. This mobile is magical! 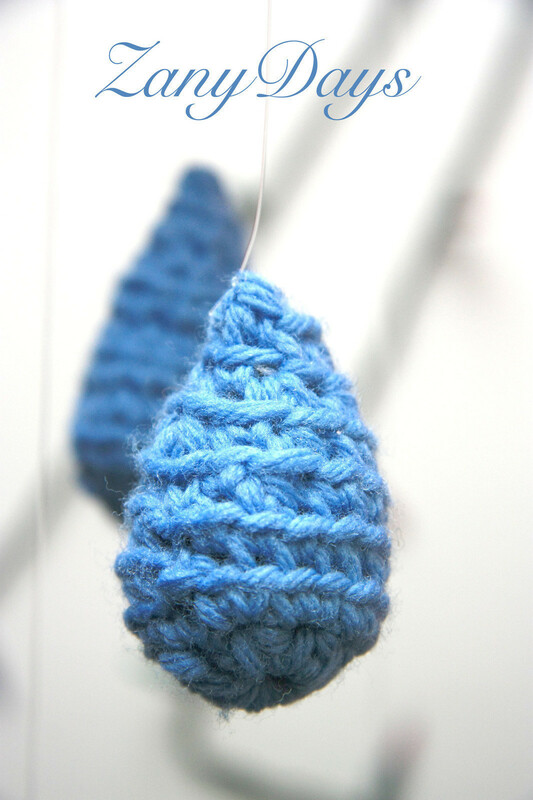 It twirls on it's own and is very sturdy once stuffed with polyfill (and extra yarn scraps in the droplets). I couldn't decide on fishing line or a crochet chain for the droplets, but I used fishing line in the end because I liked the "invisible" look. Please keep in mind that this will be out of the way of little fingers! If you are more comfortable with a crochet chain, go for it! These aren't difficult at all, just a bit time consuming. 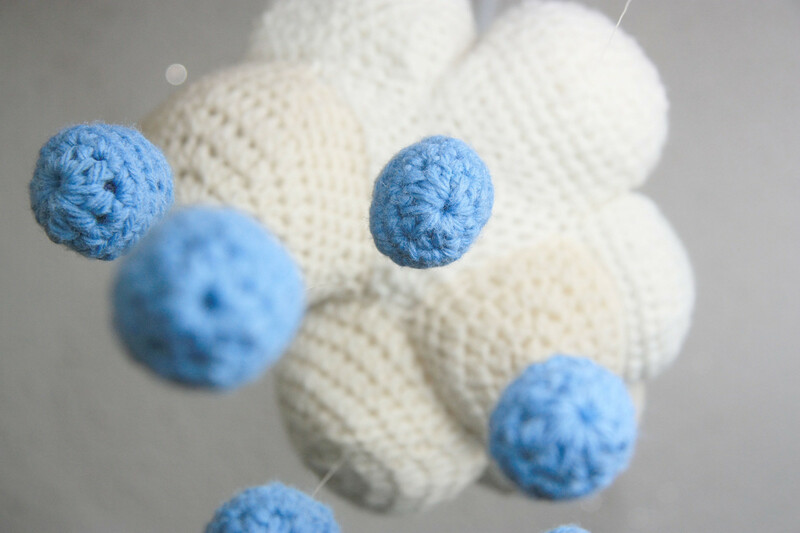 The cloud is made of 10 or 12 "cups" that are made with 11 double crochet into a ring, increased for 3 rows in double crochet and then continued in varying depths in single crochet. Raindrops are simply made with 8 double crochet into a ring, increased for one row, single crocheted in the next, and decreased equally until a point is reached. For some of them, I crocheted in the back loop only to get a sort of twirling effect. 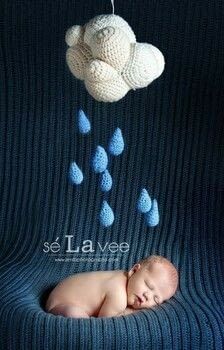 Well, found the hanging decoration I'll use for my future child's crib.